MobiDines is the only restaurant app provider that will build you a free preview app! MobiDines provides a private, branded application on multiple phone platforms for restaurants. Get your restaurant app on the app store today! Looking to consolidate your technology ordering expenses and support? Online Ordering across all platforms! 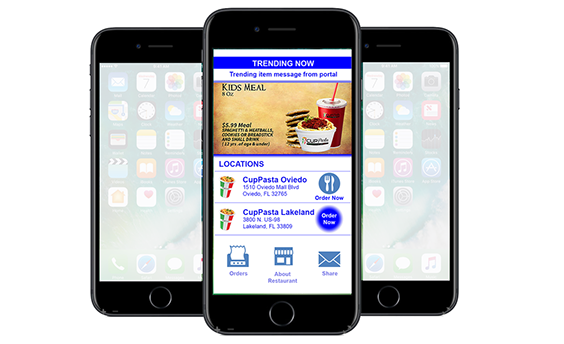 Establish a single source for all your technology ordering with intuitive, innovative mobile apps, and get internet site ordering included for free! Advertise your location, catering, reservations, and more! Restaurants implementing MobiDines solutions get a 25% - 55% increase in online and mobile orders! All Phone types, All Tablets, and Internet Site Ordering, all supported from a single implementation! With the most restaurant industry expertise in the mobile segment, and with the most restaurant apps deployed in the market, MobiDines partners strategically with customers and business partners to keep restaurants ahead of emerging technology. Pogo has been the market leader in restaurant mobile apps for more than 6 years, consistently considered one of the top mobile app design and development companies. Pogo excels at identifying the ideal approach for your restaurant to engage with your guests providing an intuitive, easy to use app which promotes ordering and sharing. MobiDines is the ONLY restaurant app developer providing real, native apps on mobile platforms (not using internet technology), making the guest ordering process easy to use, which means more orders. Focus on your restaurant, not on the technology. Contact us today to get your FREE demo app built and sent directly to your phone for you to use. We offer support to all restaurant locations by phone and e-mail, allowing franchise groups to have us support each and every location directly. Our standard support includes menu adjustments, app updates, and any content adjustment, provided 24x7 and based in the U.S.
We also upgrade all of our applications as new cellular phone technologies become available or more prevalent. Thus, you do not have to be concerned with the dynamically adjusting mobile technology market. Our platform keeps your restaurant mobile applications updated and ahead of the market.